Schedules of many families with young children are complex and inefficient as parents often have to drive their children to school and other engagements, whilst maintaining their own routines as well. 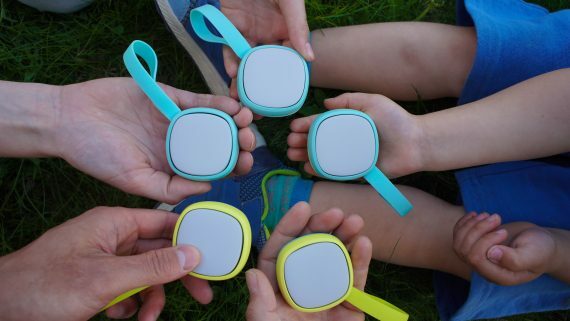 Ebbe is a travel companion for 7-9 year olds that helps children to navigate independently. With Ebbe, children can plan their journey, learn about their environment, and explore alone, or with friends! Ebbe navigates using a shifting weight. This provides subtle yet intuitive wayfinding, while providing minimal, but supportive guidance. This tactile wayfinding enables the child to keep their eyes on the road and their surrounding environment. For children learning routine paths and wayfinding is taught by looking for environmental cues in combination with the shifting weight, rather than relying on for example information overloaded phone applications. stepping beyond their comfort zone without an adult present, they can send or receive a “touch” if they would like to, by squeezing Ebbe. This sends a notification to the parent’s connected device. The parent can react to this digital “touch” by sending an abstract touch back. In turn the child will receive haptic feedback, sending encouragement in an abstract form of communication. form of an abstract haptic feedback. If the child decides to take a different route than as suggested by EBBE, EBBE can adjust to the child’s route, allowing the freedom to explore. Parameters to set safe regions of exploration can be set by the parents. EBBE can also function as a community builder by showing relative locations of friends that are also travelling. This abstract visual representation of friends creates sense of companionship and collective experience that supports the child. The visualization of peers can also incentivise exploration and encourages a more positive mindset. In the supporting application, parent and child can plan the child’s journey. This includes adjusting to desired public transportation modes, adding friends to their selected journey, setting exploration boundaries, and choosing the adult that can respond to their “touch” if necessary. This process of building the child’s journey facilitates constructive conversations between parents and children about independent travel and the responsibilities that come with increased mobility independence. Profiles of each child can be adjusted according to their needs to allow for multi children families. The aim of this project was to look at mobility through involving the general public. By means of interviewing, organising workshops, shadowing and roleplay a participatory design process was facilitated involving both stakeholders and users. This project was done in collaboration with RISE Interactive, Umeå Kommun and Ultra.